MORTILLERY is a Canadian Thrash Metal band, formed in 2009 and female-fronted. There’s only one other female-fronted Thrash band that I know of and that is HOLY MOSES from Germany. However, I’m willing to expand my knowledge, so if you more such bands, feel free to post them as a reply. Other than that, female vocalists are active in several other kinds of bands, like EPICA, THERION, REVAMP, ARCH ENEMY, THE AGONIST, DALRIADA, DAWN OF DESTINY, XANDRIA, RAM-ZET, AMBERIAN DAWN, LEAVES’ EYES, MIDNATTSOL, BENEDICTUM, DORO, ARKONA, CRYSTAL VIPER, TRIOSPHERE, TRISTANIA, EDENBRIDGE, and so on. MORTILLERY released a self-titled 5-track EP in 2010. One year later the album “Murder Death Kill” sees the light of day via Horror Pain Gore Death Productions, to be re-released by Napalm Records in June 2012. “Evil Remains” is the common track between these two releases. “Murder Death Kill” kicks off with the title track. A shotgun, alarm and off we are. Uptempo, catchy Thrash that sounds very old school, but with a modern, polished production, of course. METALLICA meets EXODUS meets DEATH ANGEL. The clean female vocals work wel here and Cara even screams in the chorus, which is übercatchy and simple. A midtempo, but thrashy bridge leads to the solo, backed by speeding Metal. All in all, a good track, but perhaps a bit too long, as after the solo and chorus, there’s nothing really different. In “Sacrifice” the tension is clear, something will break and indeed! Bang the head that doesn’t bang! Screamy vocals, too, even going higher. The chorus is a slower one, midtempo, but all reverts soon back to the speed of before. It sounds a bit like Punk Metal. Around halfway there’s a nice slow piece that speeds up towards the solo, albeit that this transition is quite long. After the solo, the bands returns flawlessly to the verses, chorus and end of the song. So far, so very good. “Evil Remains” kicks off with the guitar, after which humpa Thrash sets in, like before. That’s one characteristic on this album: the same type of beat, that typical humpa Thrash. The chorus is melodic, though, but the speed remains invariable. The solo is also present, even continues afterwards when the chorus is due once more. A short and powerful track that delivers the goods. “Fritzl’s Cellar” is about Josef Fritzl, an Austrian man who kept his daughter (at the time of the news, April 2008, 42 years old) imprisoned and even fathered a few children with her. See more on, to give one example, Wikipedia (click here). The song starts with a speech about enslavement and related, after which furious, melodic Thrash is unleashed. It’s catchy, straight-forward and even speedier in the chorus. The vocals are more aggressive then as well. All in all, another very good track. In “Outbreak” the music breaks out quite rapidly, though there’s a bit of an intro first. Same recipe: fast and catchy Thrash. The chorus is slow at first, but speeds up in the next instant, with added screamy vocals. Speaking of singing, a lot of it is high-pitched in this song. The middle serves as resting point, so to speak, to rebuild towards the solo. Also worth noting: the powerful drumming. EXODUS had “Bonded By Blood” (and BONDED BY BLOOD is also a Thrash band), MORTILLERY has “Despised By Blood”, which takes a bursting start with fast riffing, flowing over into… yes, indeed, fast Thrash with a melodic chorus. There the band takes it a bit slower, but adds aggressive vocals instead. A fast bridge leads to the solo part after which it’s business as usual. Good stuff, no complaints from my part. “Countless Suicide” takes its time to unleash the Thrash. But once there, buckle up! The vocals are aggressive and more screamy/demonic than before. However, the chorus counters with clean singing. As before, you get a bridge leading to the solo (and beyond). Said bridge is ferocious, but firm. In “Voracious Undead” the Canadians opt for a more Heavy Metal approach, as clearly shown in the slow, melodic intro. The drums play a key role here. This piece alone is already very good and could (have) be(en) made longer or used for a own song, so to speak. thus not for the fast Thrash that breaks out in “Voracious Undead”. It’s got the humpa beat from start to finish and like before, the music is wild, energetic and so on. But! But… the band changes direction halfway the track. Moments before the silence, all was one energetic whole. After that things get even wilder, more energetic, perhaps even demonic. It’s in this second half that the solo is placed. “Without Weapons” is my favourite track on the album. It begins melodically in a marriage of Heavy and Thrash. You get midtempo verses with normal singing, a Thrash bridge with a very nice rhythm and dito drumming. The singing too is very much worth hearing. The chorus, even with or thanks to perhaps, the humpa beat sounds quite happy. Consider it an IRON MAIDEN song, but in a Thrash(ier) way. Did I say how good the singing was here? Last but not least there’s “Mortal Artillery”, which is most likely the band’s name in full. As before, energetic Thrash with a good solo. The last minute is where everything slows down, fades out. 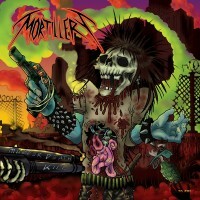 MORTILLERY’s debut album, “Murder Death Kill”, is a very positive surprise. It’s filled with catchy Thrash Metal and a good production. The music however does feel old school (METALLICA, EXODUS, DEATH ANGEL, etc…). Energetic music to get you going from start to finish. Also positive is the attention for guitar solos, which are reasonable of length. They’re not like DRAGONFORCE’s of course, but they’re not short either. The only problem, at least in my opinion, is that the band overuses that typical Thrash beat, that humpa (or polka, whatever) beat, so to speak. Other than that, recommended purchase!